Take Kathleen Home With You! 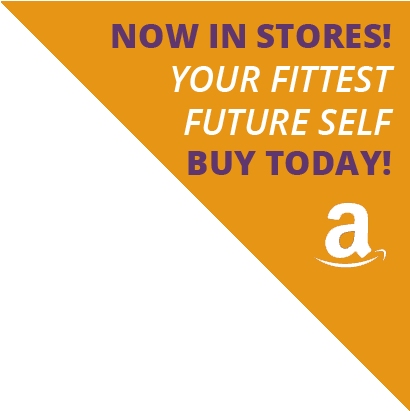 Want to create your "Fittest Future Self"? Or build a new home gym? Not exactly sure where to start? Take Kathleen home with you!! Keep on track with weekly food and exercise journals and/or chat with Kathleen on a one-on-one Skype consult! 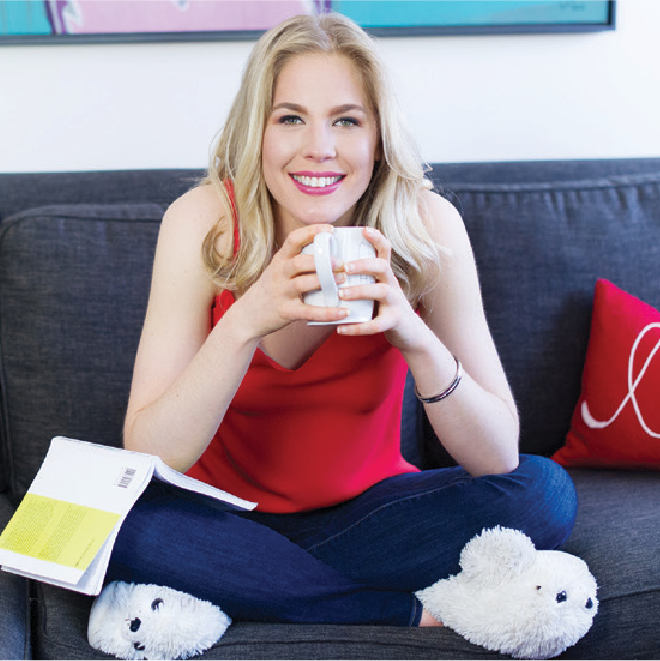 All packages start with a 55-minute Skype or FaceTime consult with Kathleen. Ask Kathleen all your fitness and nutrition questions. Leave the brainstorming session with a realistic action plan and targeted goals. A signed copy of Your Fittest Future Self and Kathleen's welcome package are included with all packages. After your one-on-one Skype call, journal your food and exercise daily. Each week Kathleen looks at your week of data and offers feedback, suggestions for new goals, tweaks, and words of encouragement. After your 55-minute Skype or FaceTime consult with Kathleen, implement your action plan, and then follow up in a 30-minute call to fine tune your progress. C. Schedule follow-up one-one-one sessions — All other follow-up sessions are $75 for 30 minutes. Can't get to the gym? Fitness classes too much of a time commitment? Don't want to sweat in front of others? No problem — I’ve got your back! Call me the "home gym hub." Use your Skype call to discuss goals, space restrictions, and finances ... the end result being a home gym built to fit your financial and lifestyle requirements. Have a $100? Great, we will build you the "$100 home gym." Have a few hundred? Great! Have more? Terrific. Kathleen will design a gym on any budget that will get you the results that you desire! Think you might need more support and encouragement? Customize your own package! Mix and match between monthly accountability, Skype calls, and in-person training! 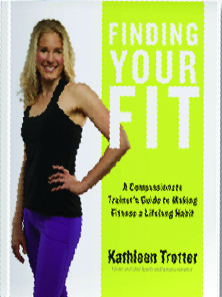 Kathleen is excited to help you find Your Fittest Future Self! Get started!! My name is Kathleen Trotter (MSc, CSN). I am a personal trainer, author of Finding Your Fit, nutritionist, life coach, wellness writer, and overall health enthusiast. I love my job. My mission is to inspire as many people as possible to adopt (in an intelligent way) a healthier lifestyle and to make healthier choices because they love themselves, not because they hate themselves. I don’t believe in body shame. I do believe in goals and results. I don’t believe in being “easy” on yourself or letting negative “brain propaganda” win. I do believe in self-compassion and holding yourself accountable. I don’t believe in being active to “create a whole new you.” I believe in being you, but working toward creating a “you” who has more healthy habits this month than last year. I believe in learning and growth. I believe in passion. I believe in joy. Most importantly, I believe in actively creating the version of yourself that you want to be, and that the key to health success is finding YOUR fit — hence the name of my first book Finding Your Fit. My work week is a combination of seeing clients at my boutique studio in downtown Toronto, writing for various publications including Huffington Post and The Globe and Mail, traveling for speaking engagements and media opportunities including monthly segments on Breakfast Television Montreal and Rogers Ottawa, promoting my book Finding Your Fit through TV, print, and radio opportunities, and working with various companies including Flaman Fitness. Personally, I love finding pockets of joy, spending time with my partner, James, trying fun fitness classes with friends and my mom, running, cycling, seeing theatre with my parents (both are in the arts), listening to audiobooks, coming up with new Kathleenisms, and attending lectures. My goal for 2018 is to be an art gallery and museum “culture vulture” on the third Sunday of every month. My services include personal training, personalized programs, group seminars, and fitness writing. Visit my Fitness Training page to learn more. Keep in touch. Follow me on Instagram, Twitter, Facebook, and Pinterest, and sign up for my newsletter to keep up to date with fitness news, recipes, and more. Also, feel free to contact me here. There's Stuff in the Works! Soon you'll be able to easily search through over 1000 articles and find relevant articles based on YOUR very own Fitness Personality. 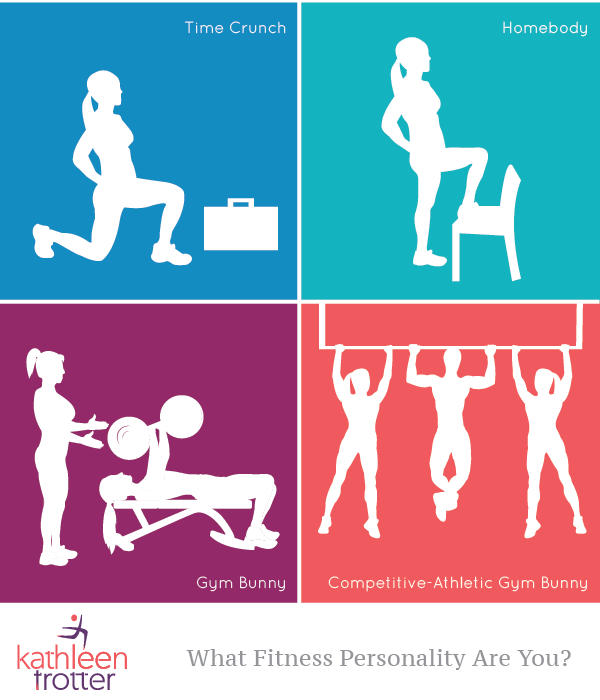 I cover four distinct Fitness Personalities in depth in my book Finding Your Fit and I include an overview on this site here. PLUS, I am filming videos based on Fitness Personalities that will be released throughout the year.